« Modelling inspiration from all genre.. I have often joked that Suffolk is the only entire county to actually be in the middle of nowhere, however contained within it is the delightful seaside town of Southwold where time really has appeared to have stood still. Unfortunately the quirky Southwold Railway is no more, closing as early as 1929, although efforts are being made by the the Southwold Railway Trust to recreate the line. 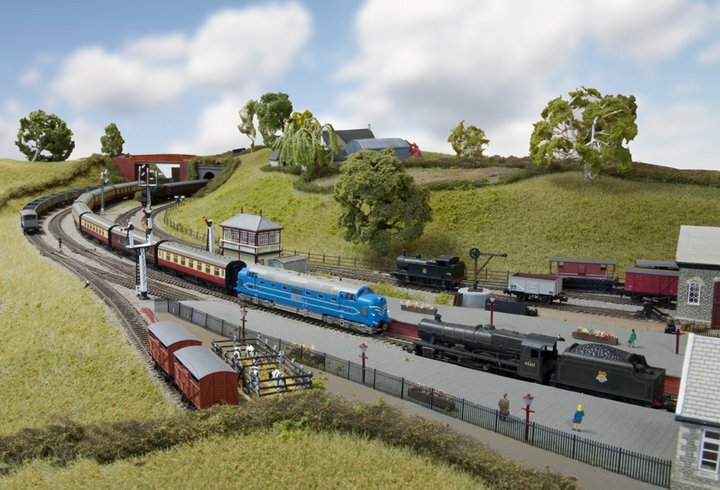 Every August Southwold plays host to the Southwold Model Railway exhibition at the St Felix School, organised by the Waveneny Valley Model Railway Club. I have exhibited at this show for the last three years assisting Mike Wild of Hornby Magazine operating one of their layouts that they exhibit along with their usual trade stand. Hornby Magazine will once again be supporting this show and this year it is turn of Mike’s N Gauge, DCC controlled layout Hettle based on the Midlands region in the 1950’s; so I shall be out of my comfort zone on all three counts, gauge, control system and region! This show has always managed to assemble a good variety of layouts and trade and this year is no exception with the highlight being the visit of the hugely impressive The Gresley Beat a 4mm representation of the LNER lines North of Kings Cross. So it is well worth a visit to the show and Southwold in general, including of course the Adnams brewery. If you do make along make sure you come and say hello, I will be the one doing a better of impression of Mike Wild than Mike does! Ahh Midland region, now you’re talking! I’ve been doing some research on the two lines that crossed to the north east of the village where I live. One was part of the London extension of the Great Central main line, eventualy merged into the LNER and then BR until Dr Beeching worked his magic on it mid to late 60’s. The other was the LNWR (until merged with LMS) Warwick (Milverton) to Weedon branch line which had passenger services until 1958 and freight until 1963. The tracks were lifted in 1964 apart from a short section from Marton Junction to the cement works at long Itchington, which continued until BR lost the lime carrying contract in 1985. This was a single track branch which ran push pull trains, eventually with ex LMS motor fitted Ivatt 2-6-2T. The line was closed before DMU’s were introduced but trials of steam railcars were unsucessful as the gradients were too steep (1 in 80 in places as the line was built on the cheap). Fright continued with Ex LMS Stanier 2-8-0 and then Sulzer Type2 on the remaining section to the cement works. It is amazing to think that for a village of 50 houses it had a station where you could catch a train to London from, when now you can’t get a bus to the next town! I’d like to model some of this, but I think I might be too time poor at the moment. Sounds like a fascinating location, there seems to be a large number of old lines in the area not to far away. Sounds like an idea location for a layout with a good variety of interesting traffic. I know what you mean about being time poor, but even just as much research as possible a a start to sketching ideas is good use of time at this stage, not mention a fun part of eventual layout building. Yes there was a lot going on before Beeching. The West Coast mainline is only 4 miles away and GWR also had a station in Leamington, right next to the LNWR station. There were three 6 arch viaducts in a radius of a couple of miles (sadly only one left now) and the 3000 yard Catsby tunnel which still exists. I think I’ll start by taking some photos of the still visible parts of the lines and see what I can match up to the period photos. Some of the pictures that I’ve found on line only give bridge numbers so they are difficult to match up and I think that BR might have renumbered them in any case.